Set of two orange String chairs designed by Niels Jorgen Haugesen for Tranekaer Denmark in ca. 1980. These rather comfortable chairs have a black solid ash frame and the back is covered with black cord. 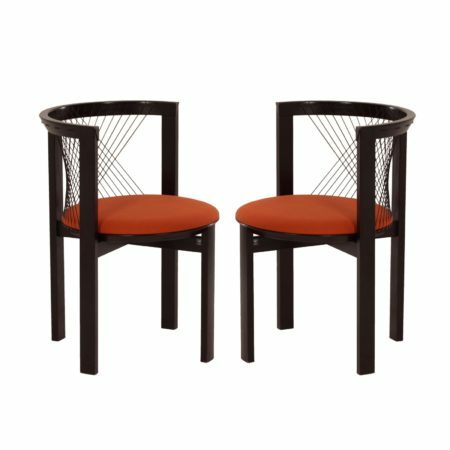 These chairs are upholstered with orange wool fabric. Considering its age in good original condition, one chair has a few spots on the fabric (see photos). Dimensions: h x w x d = 72 x 44.5 x 53 cm and the seat height is 45 cm. Marked: Tranekaer Denmark. The price is for the set.